This classic piece was a $15 purchase. Every day there are classic pieces of furniture being thrown out. Most people come to the conclusion that they are too far gone when they have broken or missing pieces. Sometimes they are, but not always. 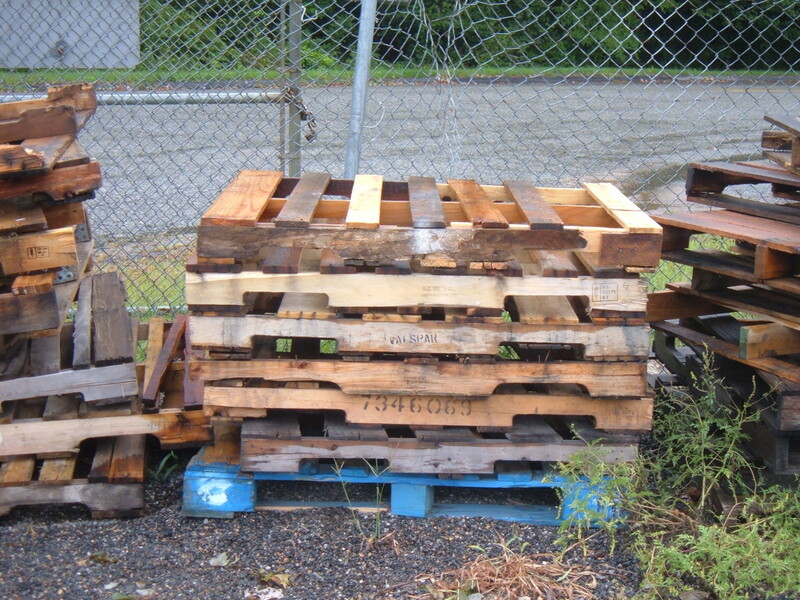 If you don't mind a little "sweat equity", several pieces can be restored. When old furniture is put alongside the road for the trash truck to haul away, I sometimes stop to check it out. If I think it still has some life left in it, it will make an appearance on my shop table. It's like seeing a poor, neglected puppy that has nowhere to go. I have to take it home to give it another chance. 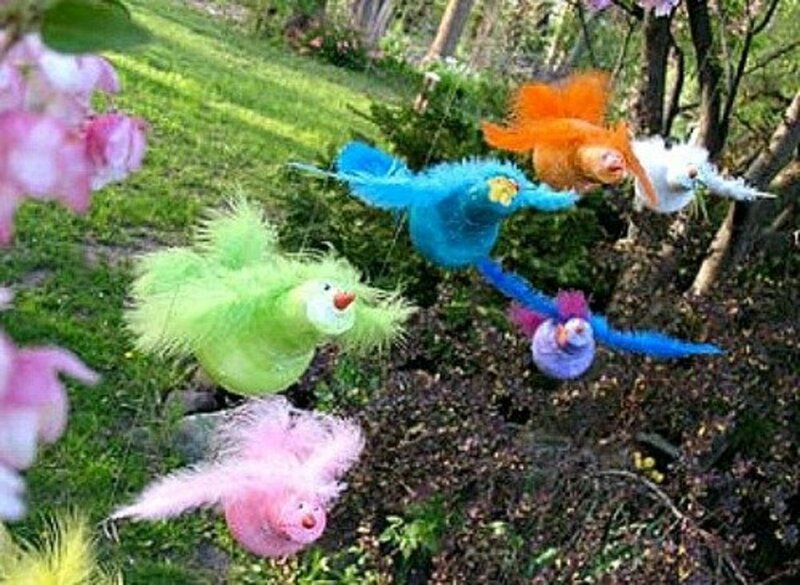 Most times I can bring things back to near their original condition. Before committing totally to restoring an old piece, look things over to do an initial analysis. You have to be careful that you don't spend more money than the piece will be worth when you are done unless you just really want it. It pays to know how the original was built. Sometimes a little glue and a refinish will do the trick; other times it is more involved. The piece above was priced for $15 at a garage sale. A quick analysis determined a few things about it's restoration. Other things had to be assumed and would only be known as the restoration process began. My wife paid the $15 and brought it home. The doors needed some major work. In the photos above you can see that the doors need some major work. Before running the other direction, I discovered that the cabinet was made of solid walnut. Walnut is a sign of quality. The broken and missing pieces would not be that difficult to replace if you have the tools to do it..
On the inside of one of the doors, someone had nailed a board to it in an attempt to hold the door together. Both doors turned out to be in very poor shape. It will be easier to make replacement doors. A patch job that was done on the inside of a door. A closer inspection shows more needed repair. 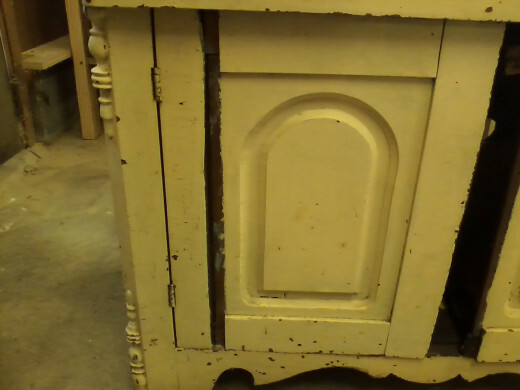 With this cabinet in the shop, other things could be determined about the restoration process. The cabinet's age began to reveal itself. Without knowing for sure, I would guess that it was built between 1900 and 1920. It was assembled with animal hide glue which will turn out to be a good thing. This detail also resulted in the cabinets demise. Animal hide glue was a very popular glue used years ago. It is one of the strongest glues available. With everything there is a weak point; with hide glue it is heat and moisture. 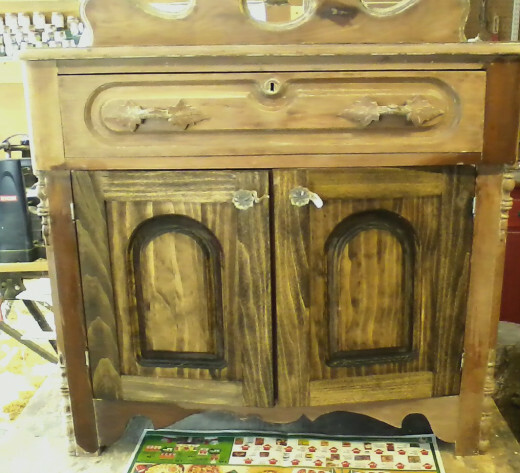 It looks like this cabinet was stored in someone's shed and had some water leak on it. This caused the doors to be in poor shape. 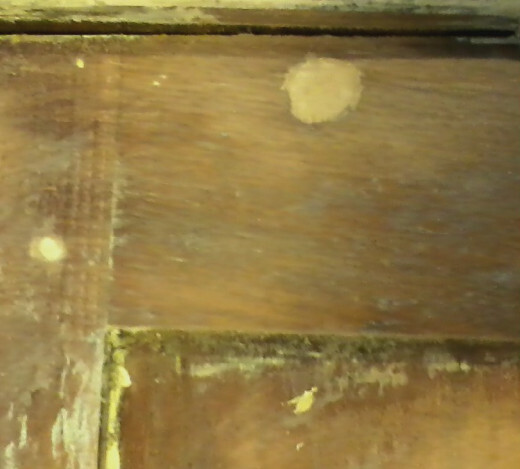 The cabinet top was made of two pieces that had been glued together and the moisture caused the pieces to separate as well. So now you are probably wondering why the hide glue was a good thing. With the top separating, the two pieces need to be totally separated to be glued back together. The best way to do this? A steam kettle on the stove. With the top removed from the base, it can be taken and held over a steaming kettle. After a few moments, viola! The two boards that the top is made of is separated in the center, causing a gap. Other things to deal with. As you can see in the photo below, someone drilled holes probably to accommodate a telephone cord. This will have to be plugged. If this cabinet has to be painted, it can be plugged with anything. If it can be varnished then a walnut plug will need to be made. Holes drilled for telephone cords. UGH! Some very positive points about the cabinet. This cabinet has some very nice design lines in it. The front corners have an angle on them and a walnut turning has been glued on for an embellishment. This is a very nice touch. The drawer pulls have been hand carved. They are in perfect condition. The whole drawer front has some very nice features to it. 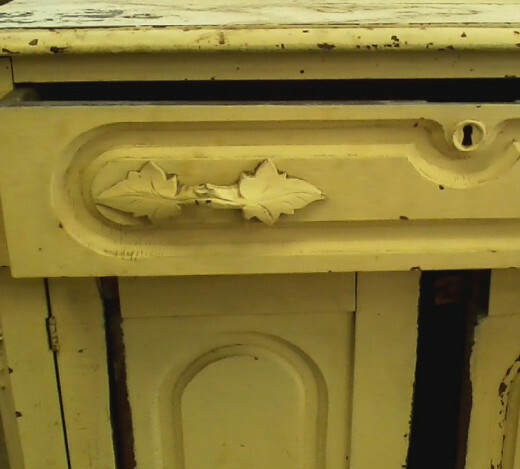 This cabinet has some very nice embellishments on it. How will this cabinet have to be finished? At this point it is still hopeful that the old paint can be stripped off and the walnut can be refinished. The beautiful wood had been painted over. Why? Let's dig deeper! With all of these items you are ready to see what is hiding beneath the paint. As you begin to scrape the old paint off just keep in mind that old paint probably contains some lead in it. When using the stripper you won't be creating any dust but a dust mask isn't a bad idea anyway. Removing pieces to make finish removal easier. The backsplash should be removed first. These are usually held on by two or three screws. Put the screws in a jar for safe keeping so that they can be easily found later. Next, remove the doors. This will make the finish removal much easier. In the photo above, the removal of the old paint takes place. 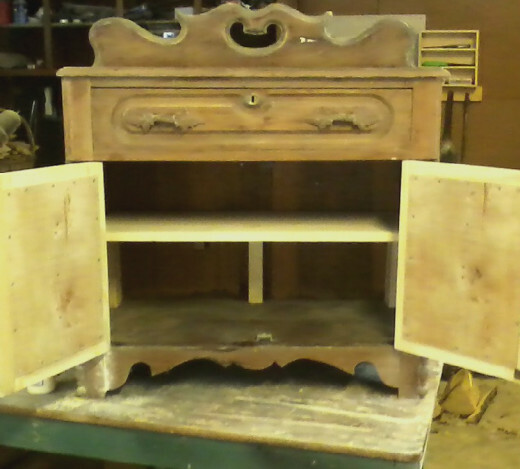 You can see the drawer off to the side that is completed. This is kind of exciting until you see the photo below. We now know why the cabinet was painted. There is a large stained spot on the top. 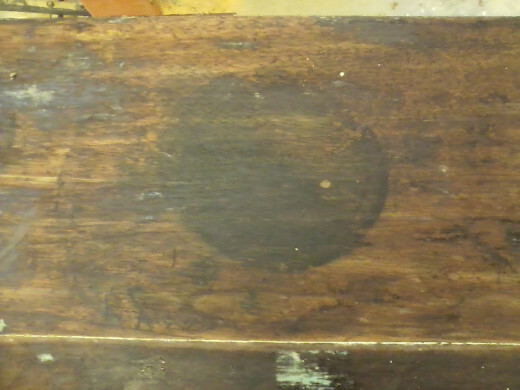 It is stained deep and can't be removed without severely altering the cabinet top. The cabinet will have to be painted. No need to be totally disappointed. There will be the nice details that will show even with the paint. This is a chance that you take. The cabinet will still turn out fine. A large stain that won't come out. This will have to be finished with a coat of paint. It will still look very nice. With the old paint stripped it is time to make the necessary repairs. 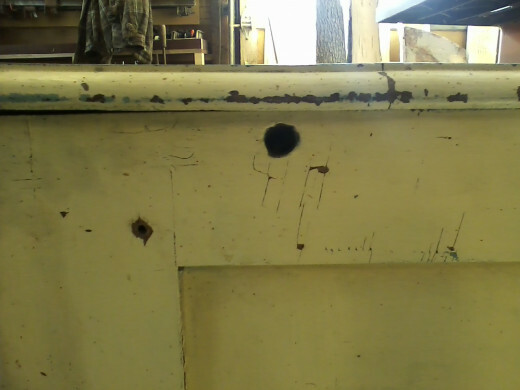 Knowing that paint will be the finish, the hole in the side is plugged with a plug made of poplar wood. The "web" frame that supports the top has some loose pieces. 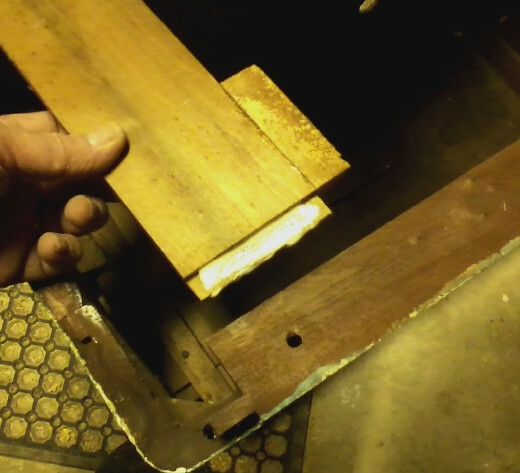 The top is removed, boards separated, and glued back together. With the top removed, the web frame and any other loose pieces are cleaned from old glue, glued again, and reassembled. I used white carpenter's to bond the pieces back together. I will clamp all of the assembled pieces together and allow to dry overnight. The holes are filled with poplar dowels and sanded smooth on the surface. With the top ready to be glued back together, glue is applied and clamped. Repairs made to the web frame that supports the top. The supporting member is driven down with a rubber mallet until it is even with the side. The top will sit directly on it. With the case repaired and the top glued back together, the entire case can now be reassembled. I put the top back on the cabinet and put the decorative back board back on. This cabinet is starting to look good again! I will now spend some time scraping some excess paint that didn't get removed and doing some finer sanding with 100 grit sandpaper. After a few hours, I get my desired results. The case is now ready to paint. 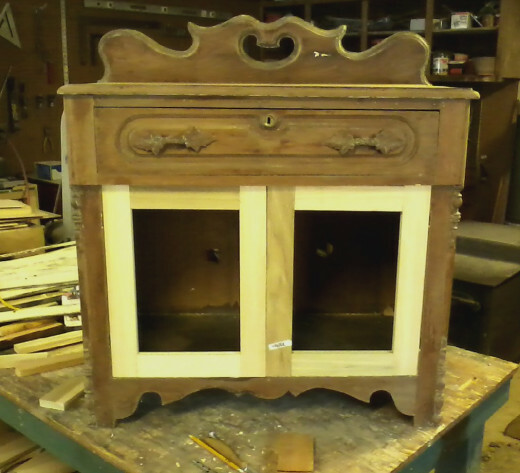 The case has been stripped of it's old finish, repaired, and is ready for a coat of paint. With the case completed, it is time to build the doors. If you don't have the tools or experience to do this you could just leave the cabinet open. I happen to have the materials so I'm pressing on. We will keep the original design and use the old doors for a pattern. Begin with careful measurements of the opening. In the photo below, you will see the door styles and rails loose fitted into the opening. The styles are the pieces that are vertical and the rails are the horizontal pieces. By dry fitting first you are assured that you are "on track" before you begin on the panels. 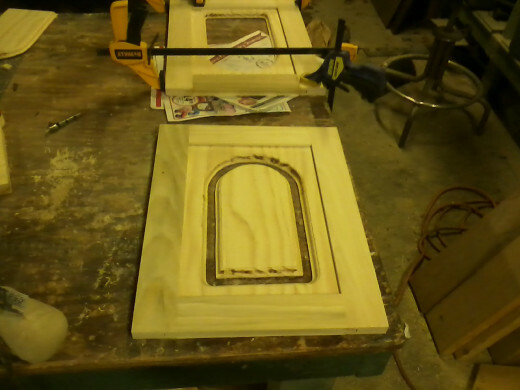 The door frames, (styles and rails), are fitted into the opening to before gluing up. This lets you make sure of the fit. With the door frames made, it is time to make the panels. We will use the old panels as a pattern. This particular door style has a recess panel with a raised portion out in the center. To build this I used poplar. The main part of the panel was first cut out and the arched shape was cut out of the center. Next, a piece of 1/4" plywood was mounted on to the back of the panel. 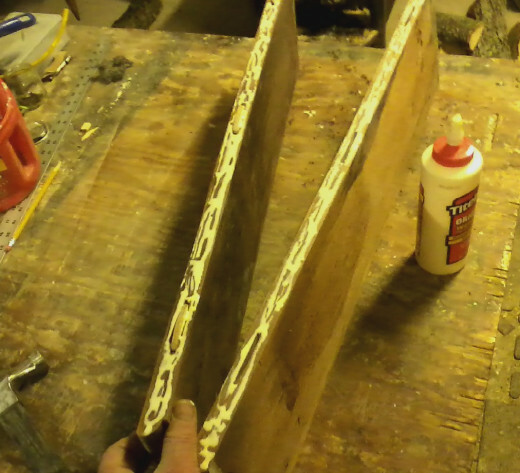 Finally the raised piece in the center of the door panel was glued onto the 1/4" plywood. When building a door like this it is a good idea to also use several 1/2" screws to secure the plywood from the inside of the door to the center piece as well as the edge of the panel. If you don't, the glued on pieces are only as strong as a the layer of veneer wood on the plywood. After the panels are assembled it is time to place them in the door frames. For the doors to look the best you will want to cut a recessed notch in the back of the door frames. This will be on the inside of the doors. You can cut rabbets or notches about 1/2" deep by 1/2" wide and then trim the panel to match the size of the recess. Then glue in place. From the front of the door the panel will be 1/4" lower than the frame, creating a nice line to frame the panel. The doors are completed and mounted on their hinges. With the doors completed, it is time to mount them on their hinges. 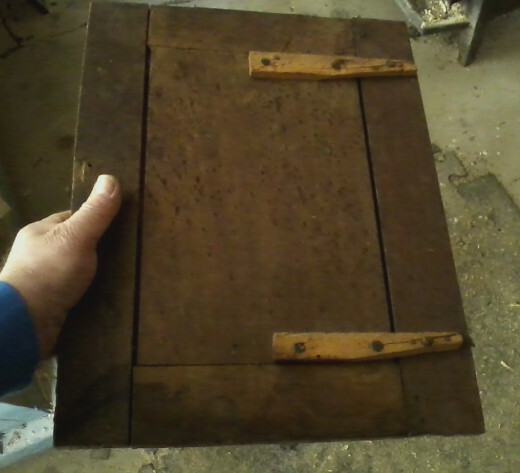 This cabinet still has the original frame on its case so the location of the hinges was already determined. The hinge location on the doors is marked and then a wood chisel is used to cut out the placement of the hinge on the door. 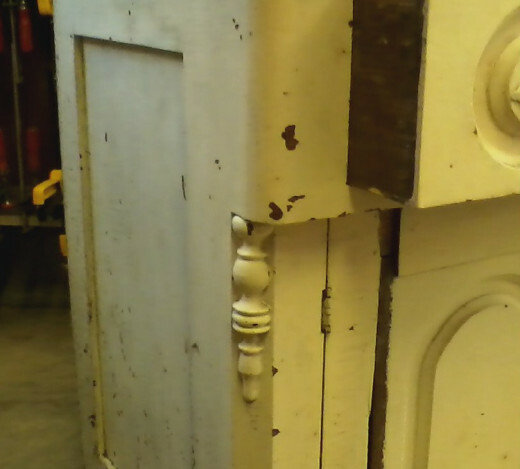 These doors only had to have about 1/16" of wood removed where the hinge attaches. With the doors mounted there is only one more thing that we will do before painting. To make better use of storage, a shelf is needed. This is just two boards glued together and placed inside. 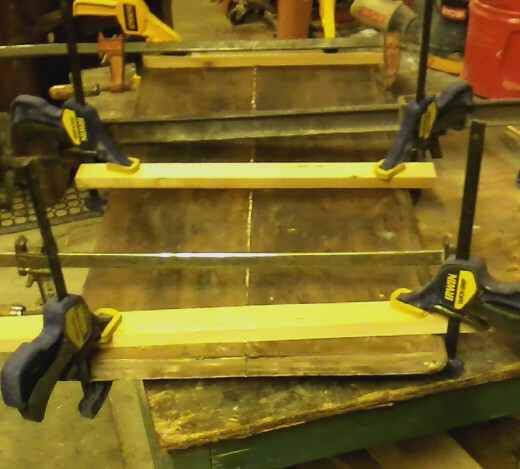 To hold the shelf in place, I used pieces of board that were 3/4" by 1" and stood them on end. I used three along the back and one on each side near the front for support. The case wood looked too thin to support a ledger to support the shelf and these pieces can just be glued to the inside of the frame. 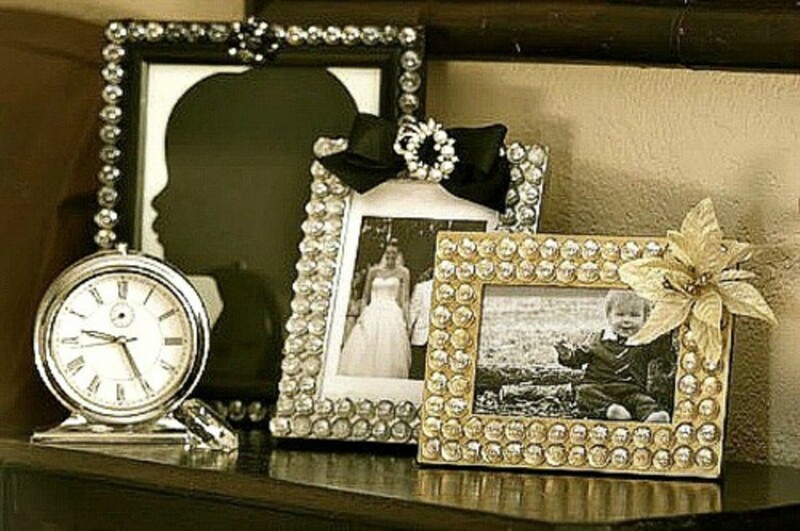 Make the pieces as high or low as you want the shelf. 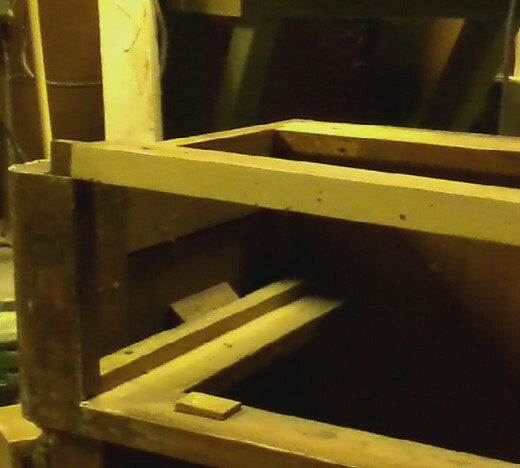 Shelf installed with support pieces currently visible. Moving on to the finish! We are finally at the point where we need to decide on a final finish. This cabinet could just get a coat of paint and look fine. A few coats of varnish/stain would do a nice job here as well. When you revive an old piece of furniture you can choose from many different finishes. 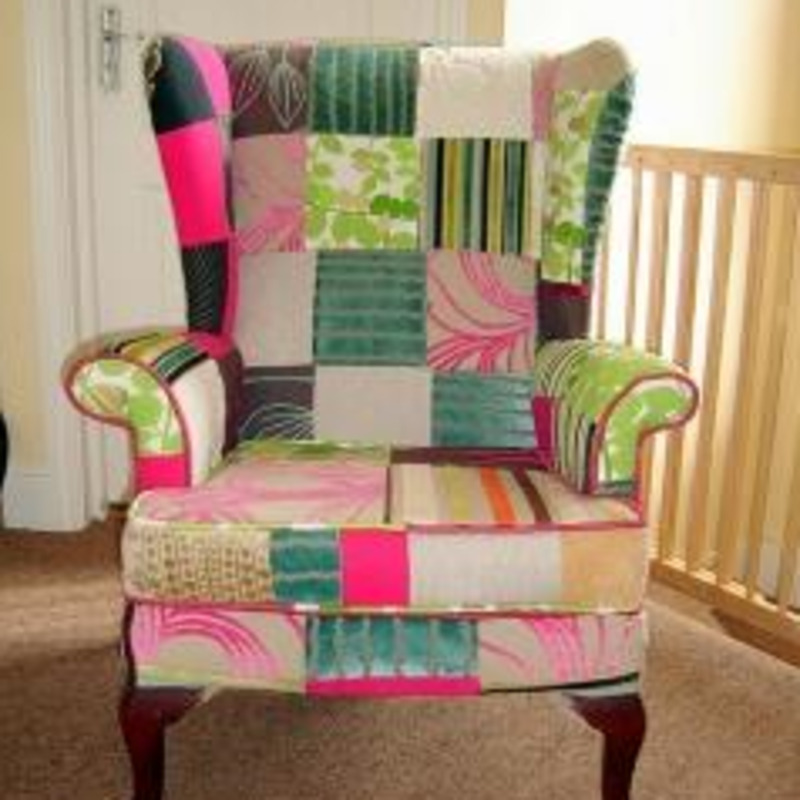 If you are going to keep the furniture for yourself, then finish to suit your décor. If you are going to try to sell it, then choose a finish that shows off the piece. This cabinet will probably stay in my home. 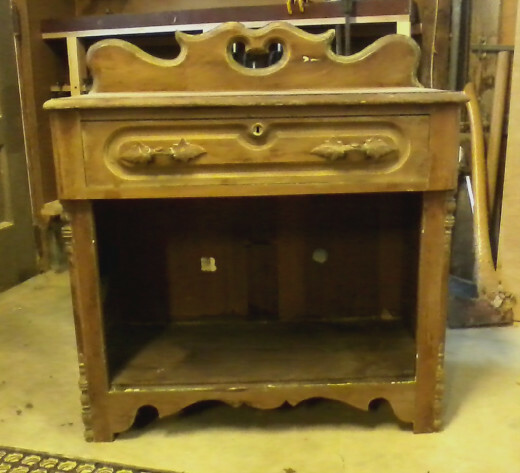 It should look good with about two coats of chalk paint and some slight distressing. Because of the distressing, the poplar doors will need to be stained dark to somewhat match the other wood in the cabinet. The doors stained with a dark walnut stain before painting. You can see in the photo above that the doors don't match the cabinet case perfectly. That is fine. Very little of the wood will show and the difference will not be detected. 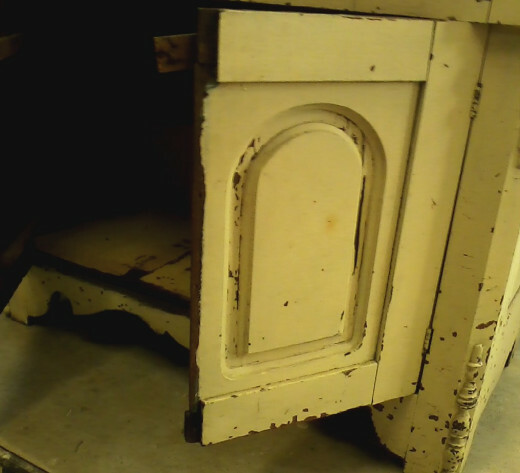 After two coats of chalk paint the cabinet is ready for some light distressing. 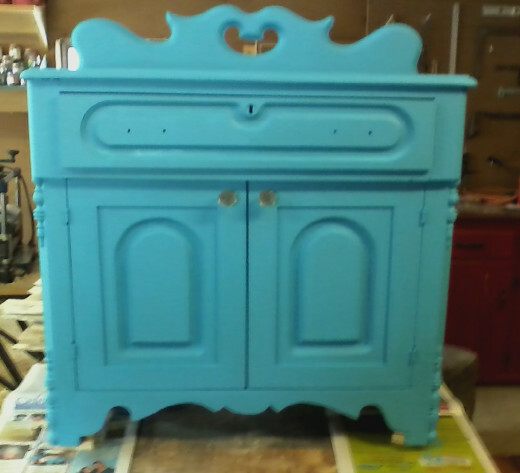 The photo above shows the cabinet with two coats of chalk paint. My wife chose the color and did the painting. Chalk paint is a very easy finish to apply and can be purchased at specialty paint stores. The paint used here is a "home batch" that we made. Most of the time we use the Behr paint samples that come in the 8 ounce size. This makes it very convenient. Choose your color but just be sure to use flat latex paint. By making your own paint, you will really have something to brag about when you are done! 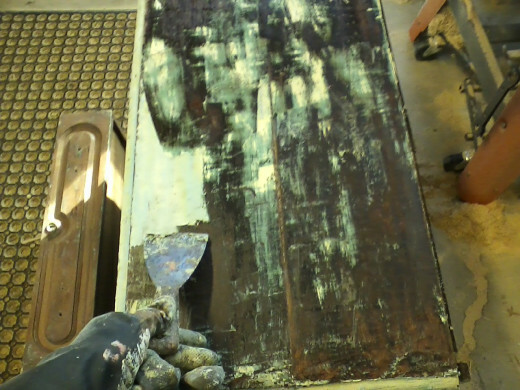 To get a distressed look, sand the paint in areas that would normally get wear. Use 100 grit paper and sand areas near the knobs on the door, the top edge in places, and some on the top and a few spots on the sides. Sand just enough until you barely start to see bare wood. When you are happy with the look, complete the finish with clear wax that is designed for wood. Don't mistakenly use paste wax. Clear wax will accentuate the effect and will not yellow over time. It looks like this cabinet was a $69 investment. Because the cabinet was repainted, the stripper wouldn't have been necessary. Sometimes you don't know for sure what will be involved. It is just part of the chance that you take. 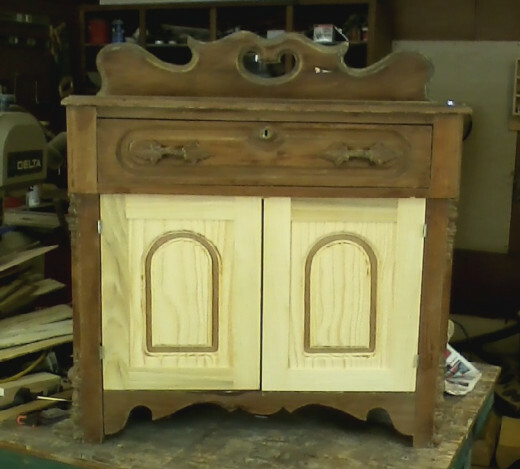 One thing is for sure though, the cabinet turned out great! 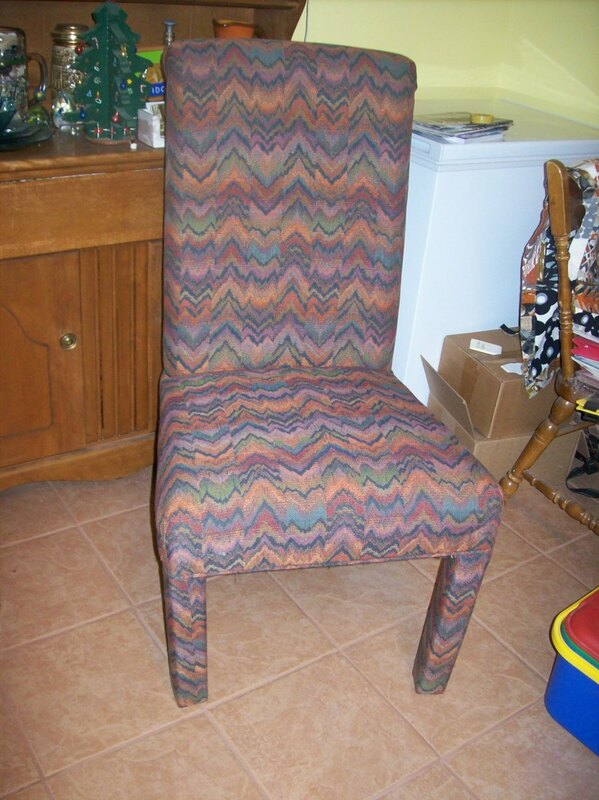 Reviving an old piece of furniture gives a person a great feeling of accomplishment! Thanks for the compliment, MsDora. I'm glad you enjoyed the hub. 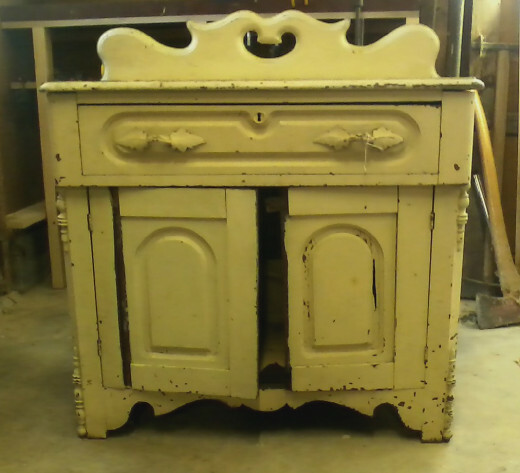 The chalk paint is a great finish, especially for older pieces. The cabinet sure turned out great. 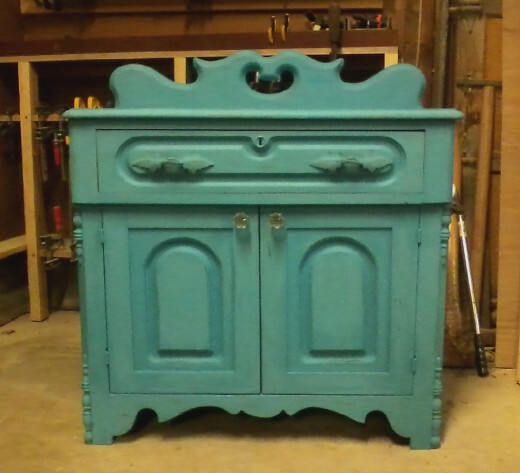 The color of that chalk paint did wonders. Thank for sharing these very useful tips. Thanks Christin for stopping by and for the nice comments! I have had great success with the "home made" paint. It helps put a little more of yourself into the project and is rewarding. I agree with the older pieces being made better. 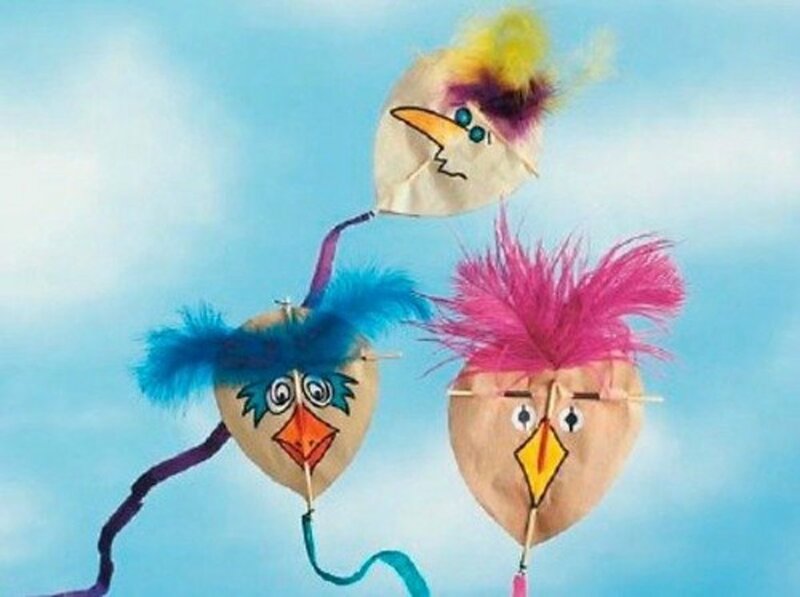 They had quality materials in them as well. Thank you again for the nice feedback! Your hubs are so fantastic and with great detail. I was wondering how to make my own chalk paint to experiment with. I've seen different techniques online, but I've seen what you can do in your tutorials so I'm trying yours :). 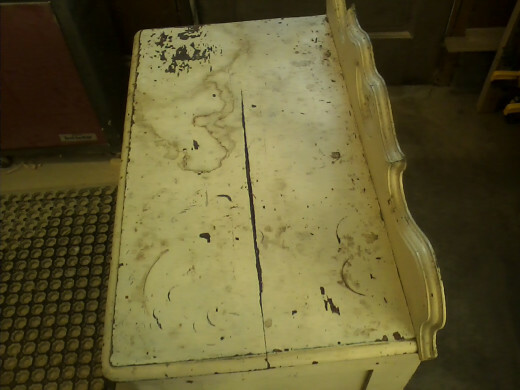 I love old furniture and it always surprises me what people will cast aside. The older pieces were made better and are timeless. Thanks for stopping by, ChitrangadaSharan. I'm glad you enjoyed the hub. Thank you for the nice feedback and the vote! Very nice and interesting hub! I love to reuse things, for the sake of environment. Moreover it saves our money too. 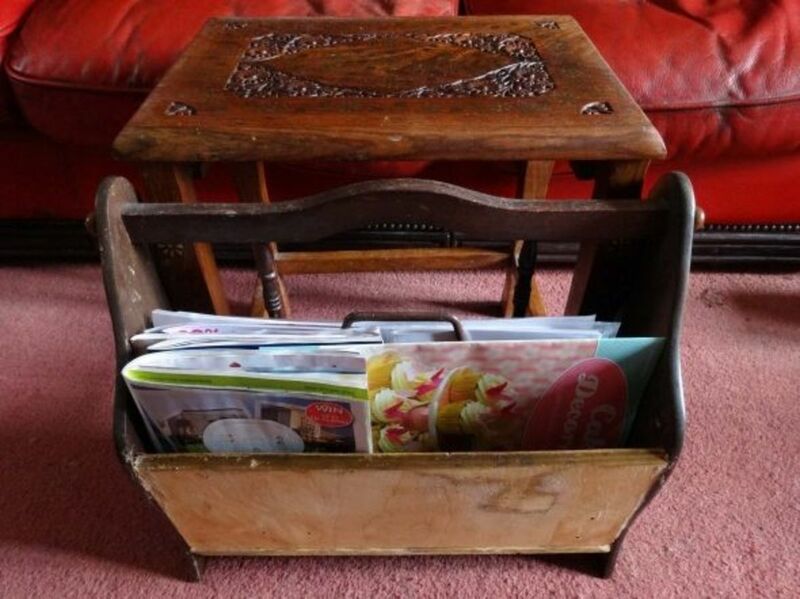 Refinishing wooden items is a great idea--a new look and ready to be used again. I like the way you provided a step by step method to do it with helpful pictures. Well presented and well done hub. Thanks for sharing, voted up as interesting and useful! Thanks Anthony for the feedback and for reading my hub. I enjoy bringing the old stuff back to life too. It's a great way to pass the time! Nice work! 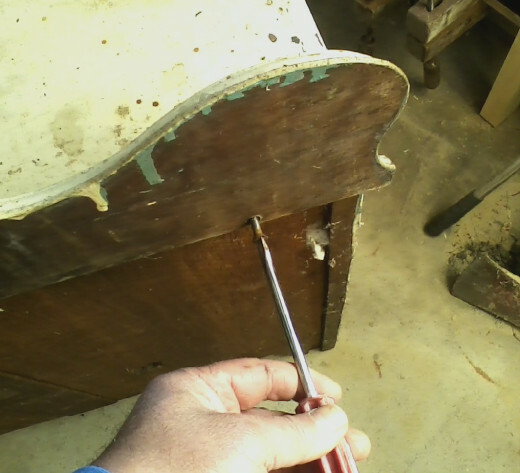 I enjoy restoring old furniture, and really appreciate your step-by-step process with detailed photos. The cabinet turned out great! This is fun to do, Peggasuse. The stripping and painting is easy. Building the doors I a little more involved. I would definitely encourage you to give it a try. Thanks for the kind words! Thanks Pamela. I probably have a total of about 24 hours in this. I did this over about a 4 day period. This is fun for me and I enjoy the process as much as the finished product. Thanks for taking the time to read my hub and the vote! Thanks Fire8storm for the nice feedback. I really enjoy projects and I also enjoy writing about them to share and encourage others. Thanks for the vote! Thank you Phyllis! I'm glad you stopped by. I'm glad that you enjoyed the hub and I value your comments! Thanks purl3agony for the nice comment! I have nothing but encouragement for you if you try to take on one of those furniture pieces. It is fun watching them come back to life. Thanks again for stopping by! This was a huge amount of work, but I can see when you have developed the skills through hard work and study and practice, it would be very satisfying to do the work and come out with such a lovely piece. Each step was explained so well, too. Voting way up and Pinning. This is a fantastic Hub! I thoroughly enjoyed reading it and the 'journey' from the rescued cabinet to finished masterpiece, which is quite beautiful. I think this is why I enjoy your Hubs so much, the transition from basic wood to a lovingly created or restored article. Thank you for sharing this with us, voted up. Hi Michael. Wonderful project and done very well. The completed cabinet is gorgeous! For $69 I will say it was well worth it. I love the color your wife chose. Wow! It was a charming piece to begin with, but you've made it even lovelier. My parents have some beat up pieces of furniture that they've offered me. I haven't accepted because I really had no idea how to fix them up. But this hub is a great guide to the step-by-step process. The photos are excellent! Thanks for sharing!! Thank you missolive! I'm glad you enjoyed the hub. Thanks for the nice compliment. Beautiful work on this piece. Thank you for sharing your tips and experience.